The Particle & Astroparticle Physics Programme is coming to its second edition, this time to be held in the autumn. Following last year's great success, the Italian Association of Physics Students (AISF) will be organising a similar event, also including some new features and further improvements. 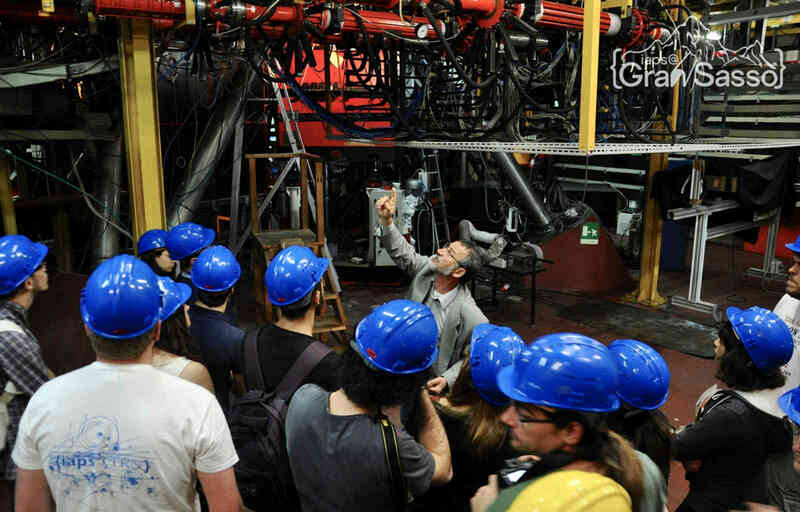 During the Programme, 40 students will be visiting the National Gran Sasso Laboratory and the Gran Sasso Science Institute in central Italy and the INFN laboratories in Frascati, Rome. Participants will meet in Rome, then move to the city of L'Aquila by coach and eventually return to Rome for departure. The event will have a focus on astroparticle physics, but a number of other topics will be touched upon, including theoretical physics, nuclear physics, high energy collisions and cosmology. Students will be expected to have a basic understanding of these subjects in order to effectively make the most of the programme. Last update: 01/10/16. The program may be subject to change. In order to enroll to the event you must be an IAPS member. We expect to select 40 students, of whom approximately half will be Italian. Participation fees are fixed at €120 for each applicant. Such fee will cover the cost of accommodation in both L`Aquila and Rome, breakfasts at the Federico II Hotel, one buffet lunch at the LNGS, one lunch at the GSSI canteen, AISF-IAPS t-shirts, one travel ticket in the Rome/Frascati area, travel from Rome to L’Aquila (and vice versa), as well as travel from the Federico II Hotel to the LNGS. Please notice that participation fees do not cover the following: Journeys to/from Rome at arrival and departure. These will need to be arranged independently; Insurance; Meals other than those officially offered in the Programme. When useful, the Organising Committee will always suggest places to eat. Note: if you are Italian and you are not an IAPS/AISF member yet you can become an AISF member while registering for this event: you need to fill in this module and make a single payment including both the quotes.module Please note that unfortunately we are not able to provide scholarships and/or bursaries for any students at this time. The Associazione Italiana Studenti di Fisica (AISF) gathers together all the Italian students of physics. It was founded in Heidelberg in August 2014 and since January 2015 is a National Committee for the International Associazion of Physics Students (IAPS). Built with Pelican and Materialize by Vittorio Erba and Giulio Pasqualetti. Last update on Wednesday, 28 September 2016 14:43 (+0200).